Come on, could I pass up a chance to include this SNL clip? The answer is no. No, I couldn’t. In other words: soup, there it is. 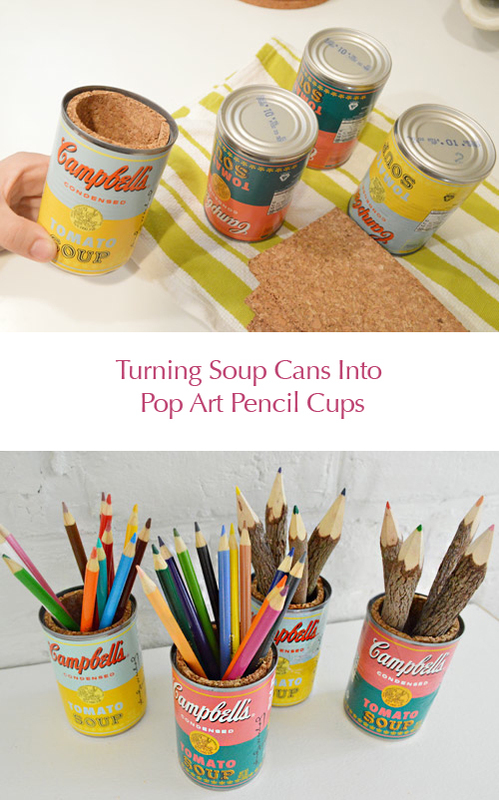 Anyway, I’m beginning to think that Friday posts should be called Fast & *Almost* Free Projects since we had Sir Butterfly last week and now we have a little soup can craft that I did in honor of my good friend Andy Warhol (ok, so we’re only besties in my mind…). How cute are these guys holding some of Clara’s drawing supplies on her desk? The colors make me permasmile. Then I carefully rinsed them out, doing my best not to soak the labels with water (slow and steady, baby). I let them dry out a bit upside down on a towel and even dragged a paper towel around the inside of each one to make sure no water was hiding in there. 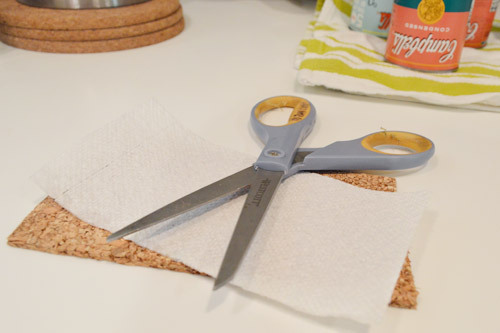 I used old cork squares that I had (leftover from this project) to create the long rectangles that could be gently curled (don’t be too rough with them or they can crack) and slipped right into each can. Voila. A little cork liner to keep anything from being sharp (they also look pretty charming, like those old cork-lined pen holders of yore). And the cork is super stuck in there once you get it in, so it’s above Clara’s skill level to somehow wedge it back out, which is nice peace of mind for a paranoid momma like myself. So that’s my little $2.80 Friday project. Don’t they look cute next to Clara’s little crayon-truck masterpiece? Here’s hoping Clara grows just as fond of my BFF Andy as I have after years of studying him along with my other artsy friends like Klimt, Vermeer, Renoir, and Toulouse-Lautrec (FIT, represent – we were required to take a million years of art history, and only now do I appreciate that). I did that same thing!!! Target has been so much awesomer lately! Amen! I just saw the new decor stuff last night and had a momentary freak out. So awesome! I imagine Miss CLara will LOVE her new canisters! Part of the fun is taking out and putting back (or maybe NOT putting back). You studied at FIT?! Our daughter would love to study at FIT. Yes I loved it! I was a general fine art major the first two years and then did an advertising design concentration to graduate with my BFA as an art director. Adorable and very appropriate for art supplies!! Love! These cans are those pull top kinds (like cat food) so the lip is where the peel top rests. Hope it helps! Maybe you could still open the can with your opener even though it has a pull top. Ooh, never thought of that. Anyone know if that works will pull tops? 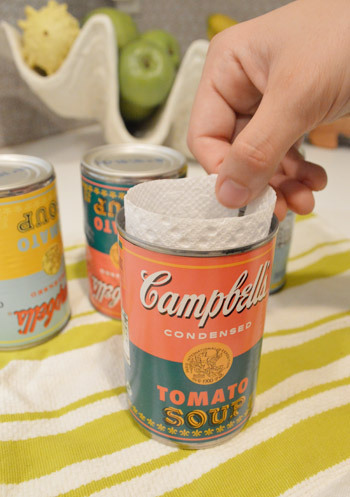 I agree… you can use a can opener to remove the little bit of metal from pull-top cans. I had a few of those I’m turning into a project that’ll be used by young hands and I made them kid friendly with my can opener. So smart! I thought about wrapping clear plastic around them to cover them, but mod podge is awesome! Mod podge is a way better idea than spray polyurethane, which was my idea. Love the soup cans! That was totally my thought. Or cover them inside and out with no voc poly. That would make some super-sturdy totally toddler-proof pencil cups! That’s awesome! I bought some of those cans last week but hadn’t decided what to do with them. AND I just happen to have some of those stick pencils that I found at Marshall’s that are looking for a home. I’m way to excited about this, obviously. Awesome! And thanks for including the JT clip! I’m biased because I sort of am obsessed with him, but I think he is top 5 beat SNL host ever! Hilarious! I love Toulouse-Lautrec :) I’ve been going to art museums since I was little but only recently started appreciating my mom taking me there! Certainly helped in my art history classes! I bought four and am planning to use them on our (future) kitchen display shelves as decor, but this project makes me think I should pick up more for some craft work! So cute! Those are rad! You are so clever with the cork! I would have NEVER thought if that. They are super cute! Love the colors, muted goodness! Clearly I can’t say anything about typos! One *of* my favorites! Ack, typos are the bane of my existence. Haha! That is SUCH a great idea! And adorable I might add. Now showing off (more or less the lack of putting away!) my pens and pencils won’t be such a terrible idea! Whoops! Forgot to include my fast-and-almost-free project in my over-exuberance to declare my love for Fridays and JT… who I have loved since high school. In fact, as part of this retro-themed Friday, I may need to go back and visit the Bye Bye Bye video! My almost free project…baby leggings…just needed some colorful fun knee socks ($3ish) I already had the cute baby legs! http://refreshandrepurpose.blogspot.com/2012/09/baby-legs.html Happy Friday! Well, it looks like I’ll be going to Target today. Thanks for the inspiration. So cute and cheery! Also, just for anyone interested in purchasing the colored pencils–who don’t live near Richmond–I have also seen them at anthro and TJMaxx. TJs actually has big ones and little ones. Justin Timberlake really needs to give up his music/acting/whatever career and join the cast of SNL. In other pertinent news, I will be doing this project immediately! What would you recommend to seal the paper on the outside? My 2 year old would have the most fun peeling the paper off instead of coloring! Do you think mod podge would work the best? Yes that sounds awesome! I would test it on one first to make sure it dries flat and doesn’t bubble or get wavy. It should be great! I found them at a local shop called Mongrel, but can’t believe I missed them at HomeGoods! I’m glad I’m not the only one that saw these and wanted to do something with them! They are adorable!!!! My friend thought I was weird when I mentioned I wanted them for decorating! I LOVE this! I love Andy Warhol! 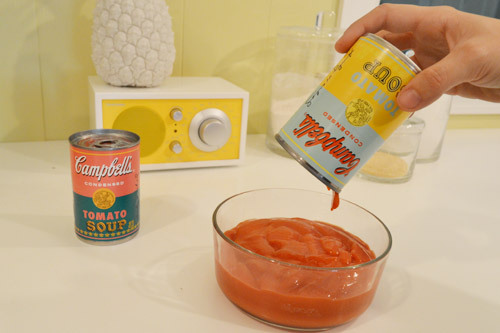 I love tomato soup! I did the same thing with the soup cans minus the cork. By the time the third kid came the need to baby proof everything had faded away. 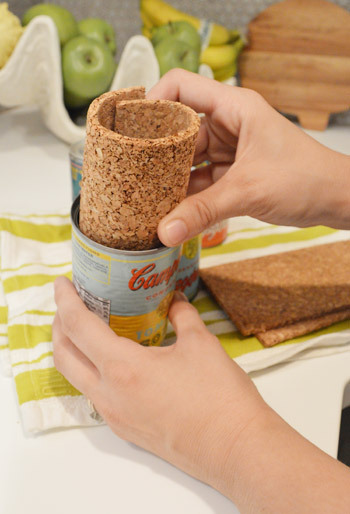 Cork is a good idea though, the cans are a bit sharp for little ones! I would second the mod podging. That will protect them and it could not be easier. Contact paper would be harder to do, but this will soak in and they will last a long time. I have been looking at these cans! I want them but I’m not crazy about tomato soup. :/ I’m so torn! Haha! LOVE LOVE LOVE it!!! So funny, I have these cans at home and was trying to think of something to do with them because they are just so dang cute.. and well now I know!!! Guess who’s going to buy cork on her lunch!…this girl. Thanks! Just a thought, would a thin coat of ModgPodg help the labels last longer, or wreck it???? and cause it to bubble. I love the idea but would worry about bubbles too. Might test it on one and report back! I looked for these at my Target yesterday and they weren’t carrying them! I’m so sad. I should never have moved to a small town, haha. 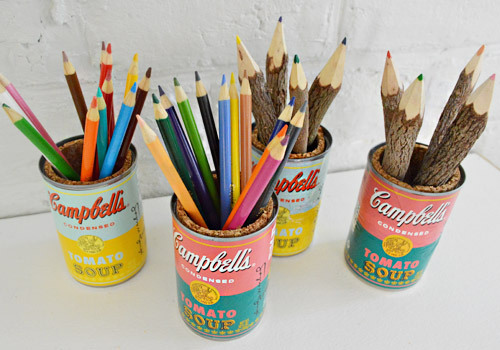 Great use of these adorable cans! I’m sure Clara will love them and they bring a pop of sophistication to the Clara corner! How awesome. I love the idea of modpodge over the labels to help preserve them! I, too, adore Andy Warhol! He’s my all-time favorite artist. One of my prized possessions is a copy of Interview magazine that he autographed. I’m also lucky to have ‘met’ him…TWICE. The first time was at — of all places — the Duran Duran concert at Madison Square Garden in March of ’84! He was walking past me and I thrust out my hand and said, “it’s an honor to meet you, Mr. Warhol”. He gave a light touch to my hand and said, “thanks”. I about died!!! A few years later, I saw him on a street corner in SoHo and did the same thing w/ the same result. I consider myself VERY fortunate to have met one of my idols. Most people don’t get that opportunity. Love the pen holder idea! 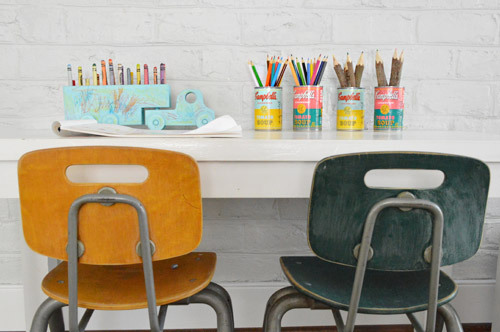 I’m definitely going to pick up some of those cans so I can do something fun with them in my home! Marshall’s, TJMaxx and HomeGoods all have those colored pencils that look like pieces of wood. I think about buying them every time I’m in one of those stores but have yet to do so. ;) I’m in love with the cans – I’ve been wondering what else can be done with them since the labels are awesome. So cute! Clara loves them. The cans are adorable, but I’m loving the “twig” colored pencils! Where did you find those??? They were from a local shop called Mongrel but we hear HomeGoods has them too! Love those can colors…. I must go get some. And I’m in need of tomato soup since I just cleaned out my out-dated things in my pantry. So cute! 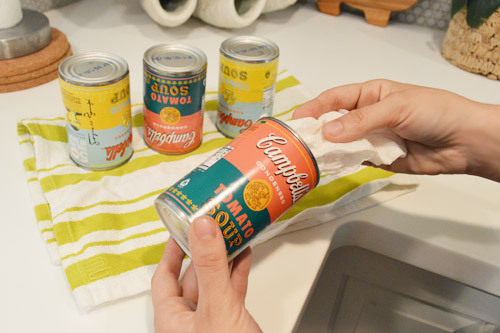 Being one of Andy Warhol’s BFFs, you know that he was an agent for MIB when he designed the soup can, right? If you are unfamiliar with this plot point in the vast history you studied. Watch Men in Black 3 – I will never look at his designs again without wondering… The idea of that and all models actually being aliens makes me howl, an nod my head like it all now makes sense. I just did the same thing with those sweet cans (sans cork)! Those cans are too dang awesome not to be showcased as something functional and decorative. I love this idea–thanks for sharing! I work at an art museum and these would make such cute containers for my pens, pencils, etc. I like how you said “in honor of my buddy Andy” like you knew him in a past life or something lol! So cute! I grabbed a set of 4 of those cans last week and they’ve been sitting in my pantry ever since. This is such a cute idea though so they may come out of hiding this weekend! I havent seen these cans around yet! I need to get myself some of those quick time :) Cute project!